As this industry grows, you are likely to hear more about it in the coming years. Starting in 2027 SCMAGLEV will connect Tokyo and Nagoya in 40 minutes, and Northeast Maglev is working to make travel between Washington, DC and New York in an hour a reality. I. 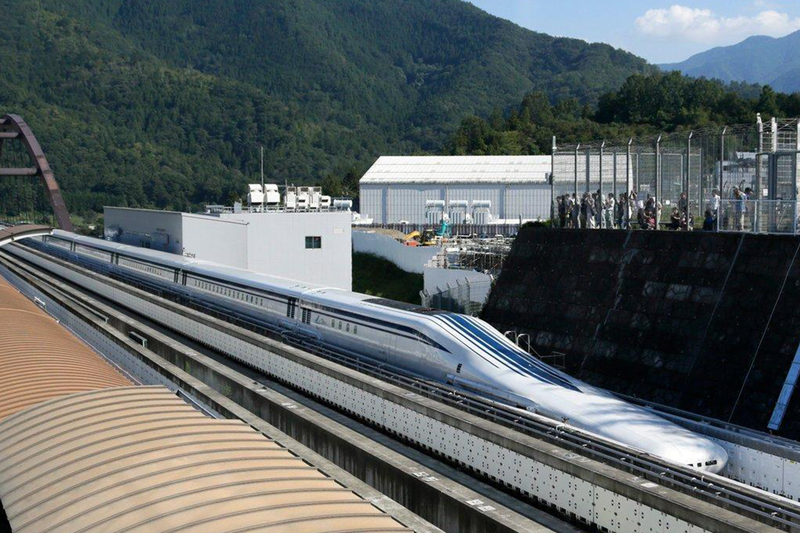 What Is Maglev and How Does It Work? Maglev is short for “magnetic levitation.” Rather than traditional wheel-on-steel and engine propelled trains, maglev trains are suspended and propelled by magnets. The trains float approximately five inches above a guideway, thereby creating zero friction and allowing faster speeds without burdensome vibration and noise. According to JR Central, the keys to the SCMAGLEV system’s high speed and acceleration are the magnetic forces acting between powerful superconducting magnets located on board the trains and two sets of coils that are installed in the walls of the guideway. Conventional electric motors contain moving parts (rotor) and stationary parts (stator). When electrified by an alternating current, the stator generates a magnetic field with alternating poles. Because the rotor contains magnets with fixed poles, attracting and repelling forces are generated between the stator and the rotor. Those forces cause the rotor to spin continuously around its axis for as long as power is supplied. The SCMAGLEV system utilizes a linear motor – picture a traditional electric motor that has been split open and laid out in a line extending down the length of the guideway. Just like a conventional motor, the SCMAGLEV’s linear motor is made up of moving parts (Superconducting magnets on the moving train) and stationary parts (Propulsion coils on the guideway), but when current is applied, the train is propelled along the guideway, rather than spinning on an axis. Image from original Danby and Powell patent. As a physics graduate student in 1909 Robert H. Goddard, the famed American rocket scientist who would later be honored by NASA for his invention of the liquid-fueled rocket, was the first to raise the idea of a magnetically levitated train. In the late 1940s, a British electrical engineer at Imperial College London named Eric Laithwaite developed the first ever full-size working model of linear motor induction. This concept and its potential were refined in the 1960s. 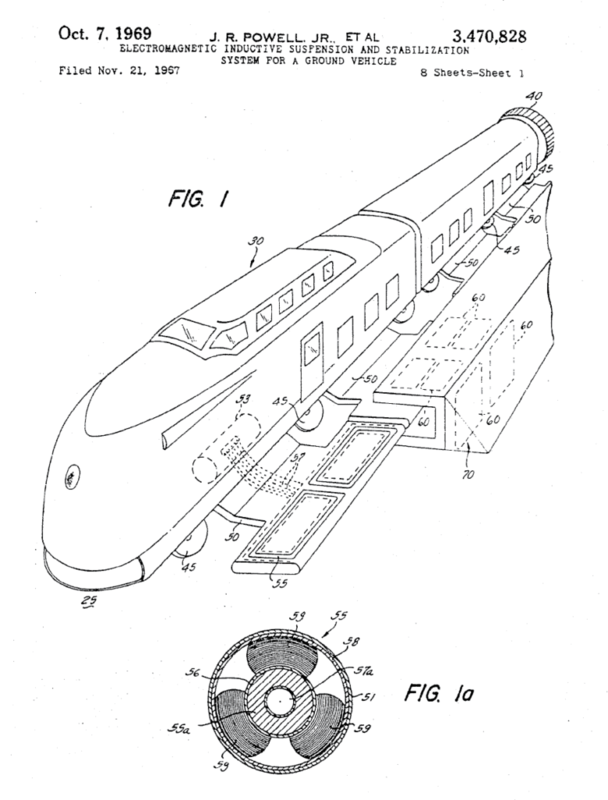 The first ever patent detailing the physics of a maglev train was awarded in 1967 to two American physicists, Dr. Gordon T. Danby and Dr. James R. Powell, who were then working at Brookhaven National Laboratory. The initial idea of a maglev train occurred to Dr. Powell in 1960 while stuck in car traffic on the Throgs Neck Bridge en route to Boston. Dr. Powell informed his Brookhaven colleague Dr. Danby of the idea. Having previously used magnets to design the then-most powerful particle accelerator in the world, the Alternating Gradient Synchrotron, Dr. Danby and Dr. Powell were already enthusiastic proponents of magnetic force. Their design intended superconducting electromagnets to generate “a suspension force, for floating the train above the ground,” and it was to use a “propeller, jet, [or] rocket” to achieve thrust. In 2000, they received the Benjamin Franklin Medal in Engineering for their work. III. Where Is Maglev Operational Other than Japan? Aside from the Yamanashi Prefecture Maglev Line in Japan (the previously mentioned 26 mile track outside the Tokyo metro area), there is a low speed, urban maglev system, called the Linimo in Japan, and there are currently two other commercial maglev lines in service: a low-speed maglev line in South Korea connecting Incheon to Incheon International Airport and a high-speed maglev line in China connecting Shanghai to Shanghai Pudong International Airport. Furthermore, the deployment of commercial maglev lines is not a recent development. In the 1980s and 1990s, there were short operational maglev lines in Great Britain and Germany. In 1984, the first commercial maglev came on line in Birmingham, England. From 1984 to 1995, a low-speed maglev connected Birmingham International Airport to Birmingham International railway station. It only traversed 600 meters and traveled slowly. While it was popular at first, lack of upgrades led to unmet potential and eventual obsolescence. Germany began testing maglev train technology as early as 1979. In July 1989 Berlin opened the M-Bahn, an elevated one-mile low-speed maglev line with three stations designed to fill transportation network gaps created by the building of the Berlin Wall. However, the M-Bahn was rendered redundant a mere two years later with the reunification of Germany. Siemens and ThyssenKrupp, both renowned giants of German industry, undertook Germany’s more ambitious maglev foray. They formed a high-speed maglev joint venture called Transrapid. From 1984 to 2012, Transrapid operated a 20 mile test track in Emsland in Lower Saxony. One would be remiss talking about Transrapid without discussing a fatal accident in 2006 when a test train collided with a maintenance vehicle. The accident was ruled a result of human error stemming from a communication failure and not from a flaw in the maglev technology. Unlike what would happen with a conventional steel wheel train, the maglev train did not derail after the collision. While Transrapid ultimately ceased operation in Germany a few years later, Transrapid designed the train sets for the Shanghai maglev. Though Maglev did not last in Europe, the knowledge and engineering acumen developed by Germany in the latter half of the 20th century proved critical to Chinese maglev success. According to JR Central, research on a linear motor propulsion magnetically levitated railway system begin in 1962 as the next-generation ultra-fast link between Tokyo and Osaka with a journey time of 1 hour. The first successful levitation run on the M100 was realized at the Railway Technical Research Institute in 1972. A Maglev test track was constructed in Miyazaki in 1977, and in 1979 the first test vehicle ML-500 achieved a world speed record at the time of 321 mph. In 1980, the guideway was modified from a reversed T-type form to a U-type form, and tests continued on the MLU001 and MLUL002N with manned running. Although fundamental tests on the basic performance of the Maglev were carried out on the Miyazaki Maglev Test Track, this track was only a single track with no tunnels, steep gradients or narrow curves. A new test line with these features was required. In 1989, it was decided to construct the Yamanashi Maglev Line. In 2014 the Japanese government acknowledged that the technological developments necessary for revenue service had been completed, and it is now extending the system to introduce revenue service between Tokyo and Nagoya. Eventually, the system will be extended to Osaka. Roughly the same distance as Washington, DC to New York, the Tokyo to Nagoya portion is expected to be complete by 2027. Generally, train speeds in the United States have not increased much since the Warren G. Harding administration. In fact, in many instances, trains are slower today than they were in the 1920s. The rare exception to this regression is the Amtrak Acela line along the Northeast Corridor; though, these trains perform at the slowest velocity of any “high-speed rail” in the world. 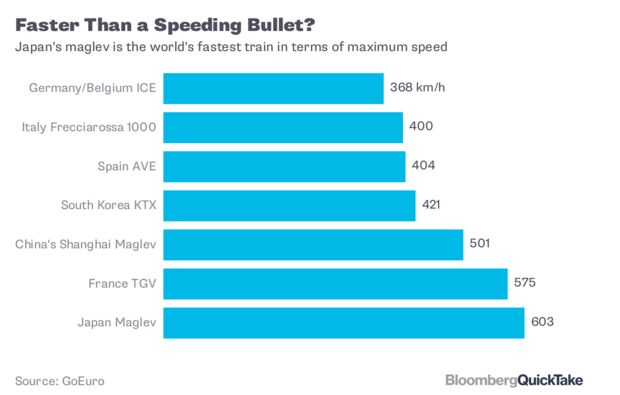 Where bullet trains in Spain, France, China, and Japan routinely travel as fast as 200 mph, the Acela only reaches speeds of 150 mph during especially straight portions of its track. There have been efforts in the past to improve the US’s slow passenger rail networks, but these only brought marginal improvement. In the early 1970s, President Richard Nixon ordered a review of the potential for US-based high-speed rail. The Department of Transportation subsequently concluded that automobiles and airplanes would satisfy America’s transportation needs in the coming decades. Instead, especially along the Northeast Corridor, efforts resulted in increased congestion. Amtrak recently unveiled its NEC Future plan calling for new generation high-speed trainsets, Union Station upgrades in Washington DC, and infrastructure investments including a new rail tunnel under the Hudson River to alleviate bottlenecks in the New York and New Jersey region. Regardless, despite Amtrak’s commendable efforts, the dual realities of increased population and past chronic underinvestment will keep the Northeast Corridor a slow-moving, congested region for the foreseeable future. During the 1970s and 1980s, Maglev also received attention from forward-thinking public officials. In 1989, Senator Daniel Patrick Moynihan wrote in an article in Scientific American that magnetically levitated trains “will define the coming century much as the railroad defined the last one and the automobile and airplane have defined this one.” The future predicted by Senator Moynihan was not then-imminent, but through the vision and work of JR Central and The Northeast Maglev, that future will become a reality.